When it comes to taking care of your smile’s appearance and health long-term, nothing beats a basic checkup and cleaning. With just two of these each year, Dr. James Olsen and our team can stop most dental problems before they even start. Plus, should you ever develop an issue, regular checkups will allow Dr. Olsen to intervene before it really has a chance to harm your smile. These services won’t only keep your teeth safe, but your dental costs low as well, as they’ll help you avoid the need for more expensive treatments over time. Why do I need checkups and cleanings even though I brush my teeth every day? Great question! While a home oral hygiene routine consisting of brushing and flossing is absolutely essential to your dental health, the fact of the matter is that it just can’t meet all of your dental needs. Your tools at home are not able to clean every single surface in your mouth, and hard to reach spots can gather plaque over time that eventually leads to cavities. 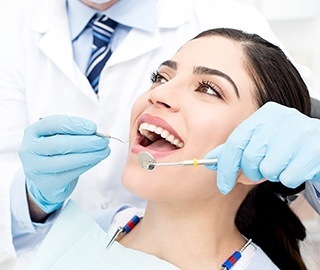 A professional cleaning allows us to target these trouble areas to keep your smile in good shape. It’s also great for preventing surface stains that can darken your teeth! Also, most dental problems are actually very hard to spot during their early stages, but Dr. Olsen will be able to notice them well before you do. That way, he can start treatment quickly, which will make the overall experience much easier and faster. Is it time for my next checkup and cleaning? We recommend that all patients over the age of three should have at least two checkups and cleanings per year, or basically every six months. Has it been more than six months since your last dental visit? If so, contact us today so we can safeguard your smile!